Spa offers massage to cure Blackberry thumb | BlackBerry Blast! One of the downsides to being a Blackberry addict is the dreaded Blackberry thumb. You know the condition where your thumb gets stiff and crampy because you spend too much time typing on your Blackberry. 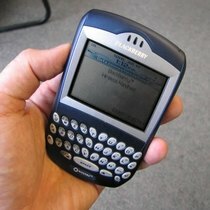 Now comes a company who claims they can help with Blackberry thumb. Graceful Services, a New York City spa, recently introduced a BlackBerry Finger Massage that promises to help with neck, back and finger-cramping caused by use of your BlackBerry. What will the Blackberry Massage set you back? It costs $60 for an hour and emphasizes the back, neck and hands.